Hi everyone. 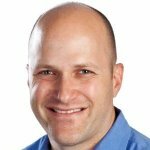 My name is Nico Posner, and I am the product manager responsible for our international sites here at LinkedIn. LinkedIn is a global network of over 42 million professionals from every country around the world, with approximately half of our member base outside the United States. Our mission at LinkedIn is to connect the world’s professionals, and we would like to do this in as many languages as possible. A frequent request from our members is to offer the LinkedIn website in their native language. Today, the LinkedIn website is available in four languages: English, Spanish, French and German (we allow users to offer their profiles in over 40 languages), but we'd like to extend that to as many professionals as possible around the globe by offering additional languages. Currently, we are investigating the best way to translate our site into more languages. Since this is a decision that will impact millions of our users, we wanted to hear from our members on what they thought were some of the most effective ways to make this happen. Fortunately, some of the best professional experts in this area are members of the LinkedIn community, so we were able to leverage their insights through a direct survey. The chart below outlines the responses we got from over 12,000 professionals this past week. We are happy to see that thousands of members expressed an interest in contributing to the translation of LinkedIn. 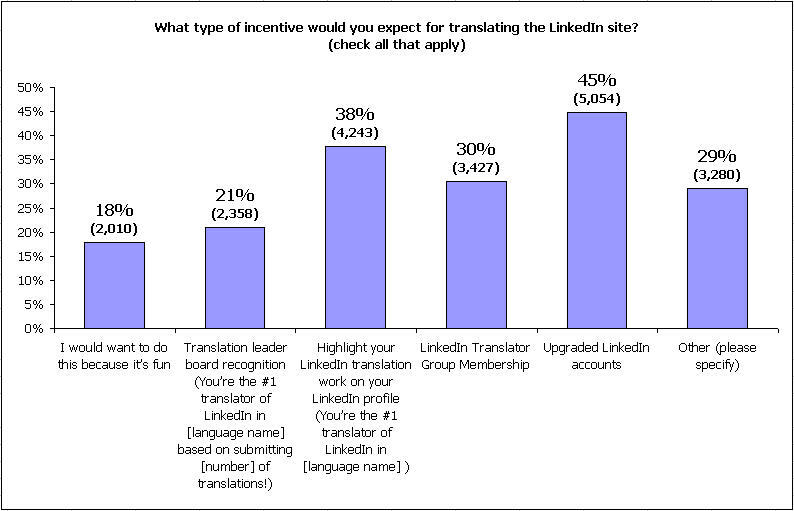 More importantly, this survey gives us a deeper understanding of what would be of value to the members who expressed interest in bringing LinkedIn into additional languages. These options typify some of the value propositions that members often get from LinkedIn, and we were interested in hearing which ones would be of most interest. You can see the range of responses above. Premium subscription was the most popular choice, followed by recognition on a member’s profile. Requests for direct compensation was the most common response under the “Other” category. Our survey shows that one of the most important benefits of a community translation effort on LinkedIn would be that a member's contributions could be highlighted directly on their professional profile. Numerous professionals demonstrate their expertise on LinkedIn every day as a means of enhancing their professional reputation. This effort could extend those benefits to members who work in the translation and localization industry. We are still in the process of evaluating different options for translating the site into additional languages. Thank you to all of the members who've taken time to offer us your valuable feedback.